A regimen of sofosbuvir and the pan-genotypic HCV NS5A inhibitor ravidasvir, with or without ribavirin, demonstrated sustained response rates ranging from 86% to 100% in the largest phase 3 trial to date of interferon-free treatment for people with hepatitis C virus genotype 4, according to study findings presented on Monday at the 2015 AASLD Liver Meeting in San Francisco. While interferon-free therapy using oral direct-acting antiviral agents has revolutionised treatment for chronic hepatitis C, there is room to optimise therapy for harder-to-treat patients. An ideal regimen would be pan-genotypic, meaning it is active against all types of HCV and could be routinely prescribed without the need for genotype testing. Gamal Esmat of Cairo University reported results from a phase 3 study of genotype 4 hepatitis C patients evaluating Gilead Sciences' HCV NS5B polymerase inhibitor sofosbuvir (Sovaldi) and the NS5A inhibitor ravidasvir (formerly PPI-668), being developed by Pharco Pharmaceuticals in Alexandria, Egypt, and Presidio Pharmaceuticals in San Francisco. HCV genotype 4 – which is predominant in the Middle East and parts of Africa – accounts for 15% of all chronic hepatitis C worldwide, the researchers noted as background. Egypt has one of the highest hepatitis C prevalence rates in the world, 90% of which is genotype 4. So far this genotype not been as extensively studied as genotype 1, which is the most common type in Europe and the US. Approved regimens include sofosbuvir/ledipasvir (Harvoni), paritaprevir/ritonavir/ombitasvir (Viekirax), and sofosbuvir plus ribavirin, but cure rates are lower than those for genotype 1. Participants in groups 1a, 1b and 2 were randomly assigned to receive 400mg sofosbuvir plus 200mg ravidasvir once-daily either with or without ribavirin for 12 week. People in group 3 were randomised to receive sofosbuvir plus ravidasvir with ribavirin for either 12 or 16 weeks. The primary study endpoint was sustained virological response, or continued undetectable viral load at 12 weeks after completion of treatment (SVR12). At the time of data analysis 266 of the 300 participants had either reached the SVR12 time point or discontinued treatment prematurely. Four patients without cirrhosis and 30 patients with cirrhosis were still in the post-treatment waiting period. Looking first at treatment-naive participants without cirrhosis, SVR12 rates were 100% for those treated with sofosbuvir and ravidasvir alone, and 98% for those who added ribavirin. Among treatment-experienced participants without cirrhosis the response rates were 95% and 100%, respectively. Turning to participants with cirrhosis, SVR12 rates were 93% for treatment-naive patients treated with sofosbuvir and ravidasvir alone, and 92% for those who added ribavirin. Among treatment-experienced patients with cirrhosis response rates were 86% and 100%, respectively, for those treated for 12 and 16 weeks. There were no on-treatment viral breakthroughs and none of the participants without cirrhosis relapsed after finishing treatment. Among patients with cirrhosis there were six post-treatment relapses, including one person who discontinued due to an adverse event after only 8 weeks of treatment. Four of the relapsers were taking ribavirin. Half of the relapses occurred by week 4 and half by week 8 post-treatment. No one treated with the triple regimen for 16 weeks relapsed. In a per-protocol or as-treated analysis, sustained response rates were 100% for participants without cirrhosis, 94% for participants with cirrhosis and 98% overall. Treatment was generally safe and well-tolerated. There was one serious adverse event considered possibly related to study drugs, transient symptomatic bradycardia (slow heartbeat), which Esmat noted that this is a rare side-effect of sofosbuvir. Overall adverse events rates were low and similar across patient groups. The most common side-effects were headache (13%), abdominal discomfort (6%), fatigue (5%), itching (4%) and diarrhoea (2%). Three people taking ribavirin developed anaemia and two lowered their ribavirin dose. "Ravidasvir + sofosbuvir is a promising new once-daily oral treatment that was well-tolerated and achieved high SVR rates in HCV genotype 4 patients," the researchers concluded. Asked why the study did not include a ribavirin-free arm for treatment-experienced cirrhotic patients, Esmat said the researchers had thought ribavirin would be necessary, but after seeing these results they want to study this. He was asked whether 8 weeks might be enough for easier-to-treat non-cirrhotic people and said this also deserves further study. Esmat G et al. High virologic response rate in Egyptian HCV-genotype 4 patients treated with ravidasvir (PPI-668) and sofosbuvir: results of a large multicenter phase 3 registrational trial. 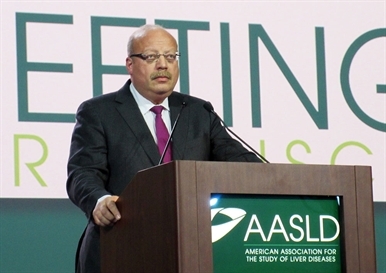 AASLD Liver Meeting, abstract LB-4, 2015.